Physically I steadily recovered from the subsequent operation. My husband Martin has been beyond amazing throughout visiting every day and having the house adapted with various gadgets to make life easier when I came home. I am blessed with what my father called pig iron – which basically translates as stubbornness! – but especially in the face of adversity. So I progressed from wheelchair to walker to two crutches and now to one crutch. 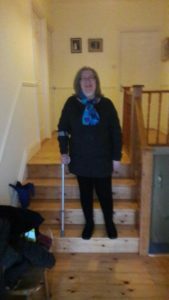 My mobility is, and will remain, impaired but, determined to get out of the house, I started catching the 145 bus and going the two stops necessary to take me into the heart of Bray and to the heart of that place of saving, Purple House. Having walked the mini marathon a couple of times for them I knew they were there. And I also knew that the wounds that nobody could see, and that I didn’t talk about, needed to be healed. My brother Rob was another constant visitor when I was in hospital and, as soon as was possible, had me in a wheelchair and brought me across the road to a restaurant and also a church when I was beginning to forget that I could still go outside. Going into Purple House is like stepping from noise and busyness into a church. Even though it is right in the centre of a bustling town, exactly where it needs to be so people can access it, the peace, calm and gentle welcome are tangible as soon as you go through the door. I refer to the “gentle welcome” as, being used to solving things for myself, I may well have reacted like a startled colt if I had felt swamped by kindness. The balance is just right. I had a chat and was made aware of various things that I could become involved with and have found the Moving Beyond Cancer sessions with Emer and Claire invaluable. There is no pressure to join anything but, because of the atmosphere, and the attitude of the people there, I found myself wanting to embrace the space being created for me rather than turning tail and running away. It is a place where I felt beckoned rather than told what to do. The various activities are not all listed out at the beginning which left me encouraged to inquire further and to explore and experiment. What I found to be a major help was simply being with people. Having worked all my life I began to feel lonely being in the house by myself. In spite of my best efforts I was starting to become disabled, emotionally as well as physically. 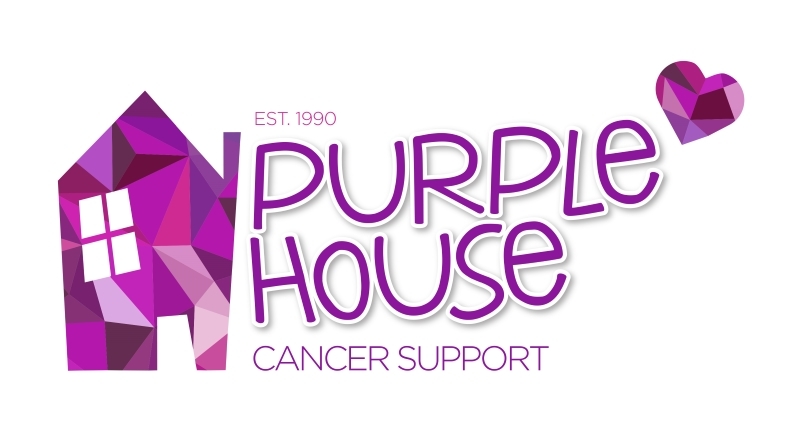 Purple House has given me back the enjoyment of being part of things. I have learned to trust my own opinions and outlook on life. Having become part of a group of people who help, encourage and laugh with each other I am very glad that I took that bus those two stops and allowed all in Purple House to embrace me. As Dusty Springfield sang “Things will be great when you’re downtown”.